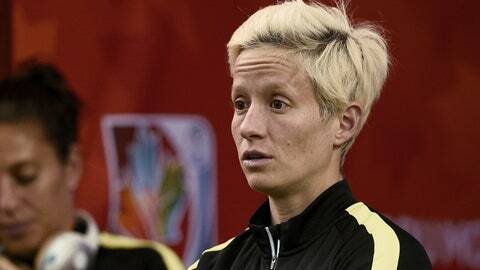 Megan Rapinoe suffered an ACL injury in training ahead of USA's Victory Tour match against Trinidad and Tobago. Injuries are part of soccer. When United States women’s national team midfielder Megan Rapinoe tore her ACL in a scrimmage Friday at the University of Hawaii, her coach and teammates were ready to take up their battle again against poor field conditions. The injury reignited the anger felt by U.S. players, who were among an international coalition that had threatened to sue FIFA over the use of turf fields in the 2015 Women’s World Cup. "It happened very fast. It was certainly non-contact. There were plates just off the field and she came off the field on the play. Did she catch one of those? I don’t know,” U.S. coach Jill Ellis said about watching Rapinoe go down. Then, on Saturday, it got worse. Upon walking into Aloha Stadium, where the U.S. women’s national team is set to play against Trinidad and Tobago (live, Sunday, 8 p.m. ET, FS1, FOX Sports Go), Ellis could not contain her outrage as she talked to U.S. Soccer officials as they stood on the buckled turf. Nearby, U.S. striker Alex Morgan did not mince words. Relive the 2015 Women's World Cup with the best images of the tournament. "The training grounds that we were given and the playing surface of the stadium were horrible. I think it’s hard because no one’s really going to protect us but ourselves. So we’re put in a very hard position because obviously we want to play in front of these fans and we want to train before the game but injuries happen when you don’t protect yourself and when you’re not protected from those higher up from you,” Morgan said. The most popular player on the U.S. team, Morgan is worth millions of dollars in sponsorship deals and was the centerpiece of a blockbuster trade in the four-year-old National Women’s Soccer League. It is no small matter when a player of Morgan’s stature effectively charges U.S. Soccer Federation officials with failure to protect the U.S. women. Ellis, too, could barely control her criticism of the process U.S. Soccer has used when picking stadiums for the women’s team. After winning the 2015 Women’s World Cup this summer, the team was contractually entitled to a 10-game Victory Tour — an enterprise that would help promote the vaunted women’s team while bringing some extra pay. 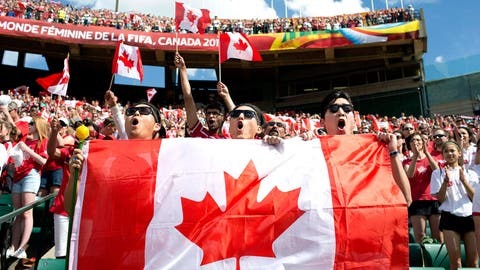 However, with many grass or better turf stadiums booked for football, and given U.S. Soccer’s desire to promote the team in new cities across the United States., the women have found themselves facing the same conditions that prompted them to mount a legal challenge against FIFA. U.S. Soccer spokesman Neil Buethe could not confirm whether the Aloha Stadium field actually had been vetted by anyone at U.S. Soccer. The shame of it is that as eager as these U.S. women’s team players are to share their World Cup win and to promote women’s soccer, they continue to feel like second-class citizens not only in pay but in something more elemental as in field conditions. That may change, Morgan said. "The team needs to be a little more vocal … about whether this is good for our bodies and whether we should be playing on it if the men wouldn’t be playing on it. We’ve been told by U.S. Soccer that the field’s condition and the size of the field are the first two talking points of when they decide on a field, so I’m not sure why eight or nine of our 10 Victory Tour games are on turf whereas the men haven’t played on turf this year. There have been zero games, so that’s a concern of mine,” Morgan said. In the end, it won’t matter how Rapinoe tore her ACL. It’s just a fact now that surgery will take place and the 30-year-old playmaker will be challenged to regain fitness in time for the 2016 Olympics, which the U.S. aims to qualify for in February. The team is already in the hunt for a center midfielder to play alongside Morgan Brian, now that veteran Lauren Holiday has retired.